the eukaryotic microorganism responsible for interstitial pneumonia in immunocompromised patients. The exact taxonomic position remains unclear, because the organism has morphologic similarities to protozoa but shares substantial 16S ribosomal RNA and mitochondrial DNA with some species of the Ascomycetes. P. jiroveci fails to grow on fungal culture media but takes up fungal stains, and infections from it respond to antiprotozoal as well as to some antifungal drugs. See also: Pneumocystis jiroveci pneumonia. a microorganism that causes pneumocystosis, a type of interstitial cell pneumonitis. New nomenclature for Pneumocystis carinii, the microorganism that causes interstitial plasma cell pneumonia in immunodeficient people, particularly those with AIDS. An opportunistic fungus that causes lung infections in those with immunosuppressive diseases and conditions. It was formerly called pneumocystis carinii. Association between a specific Pneumocystis jiroveci dihydropteroate synthase mutation and failure of pyrimethamine/sulfadoxine prophylaxis in human immunodeficiency virus positive and negative patients. Pneumocystis jiroveci pneumonia in the Federal Republic o Germany in the era of changing antiretroviral therapy -IDKF 13- German AIDS Study Group. 7) On HRCT, lipoid pneumonia may show crazy-paving, a colorful description of patchy interlobular and intralobular septal thickening and ground-glass opacity that may also be seen with other diseases, including pulmonary alveolar proteinosis, lung edema, Pneumocystis jiroveci pneumonia, and bronchioloalveolar carcinoma. Adjunctive corticosteroid treatment of clinical Pneumocystis jiroveci pneumonia in infantsless than 18 months of age--a randomised controlled trial. Previous studies looking at the clinical profile of hospitalized HIV-infected patients in India have shown tuberculosis (both pulmonary and extrapulmonary) and candidiasis to be common opportunistic infections, with smaller numbers of cryptococcal meningitis, Pneumocystis jiroveci pneumonia and cerebral toxoplasmosis (1,2). Pneumocystis carinii pneumonia (PCP) caused by Pneumocystis jiroveci (PJ) remains an important cause of death in children with HIV infection. 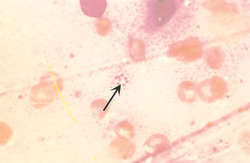 This stain has also been used to detect parasites such as Acanthamoeba, Microsporidium, Pneumocystis jiroveci, and Naegleria. Diagnostic accuracy of serum 1,3-p-D-glucan for pneumocystis jiroveci pneumonia, invasive candidiasis, and invasive aspergillosis: systematic review and meta-analysis. 82 %) cases had Pneumocystis jiroveci pneumonia, 34(33. Clinical picture of Pneumocystis jiroveci pneumonia in cancer patients.